The Patient Protection and Affordable Care Act – otherwise known as the ACA or ObamaCare – was signed into law four years ago this week after tortuous rounds of planning, posturing, arm-twisting and televised negotiating in Washington. And while many of the features (to say either ‘benefits’ or ‘drawbacks’ immediately displays one’s political bias) of ObamaCare are only now taking effect, this is a good moment to take stock, step back from the thrust and parry of partisan bickering and reflect on what has actually happened since America decided – with the GOP kicking and screaming defiance to the bitter end – that as a country they would no longer tolerate the spectacle of millions of people without health insurance or reliable access to preventive medicine. Perhaps surprisingly, given the likely political leanings of a Ted Cruz facebook follower, the majority – the real, undeniable, vast majority – of responses to Cruz’s question are unabashedly, overwhelmingly in favour of ObamaCare. The warmth of these responses to the effect of ObamaCare – some from staunch Republicans – is quite arresting, and really reveals the gap between the GOP rhetoric on healthcare reform and the way it is perceived by many of those directly impacted. This is not to say that there are not dissenters among those who answered Ted Cruz’s question on facebook – there are plenty. But the fact that they are in such a minority (and that they often failed to directly answer the question in terms of impact on their finances or lives) again exposes a fundamental weakness in the Republican party’s full-throated opposition to the bill. 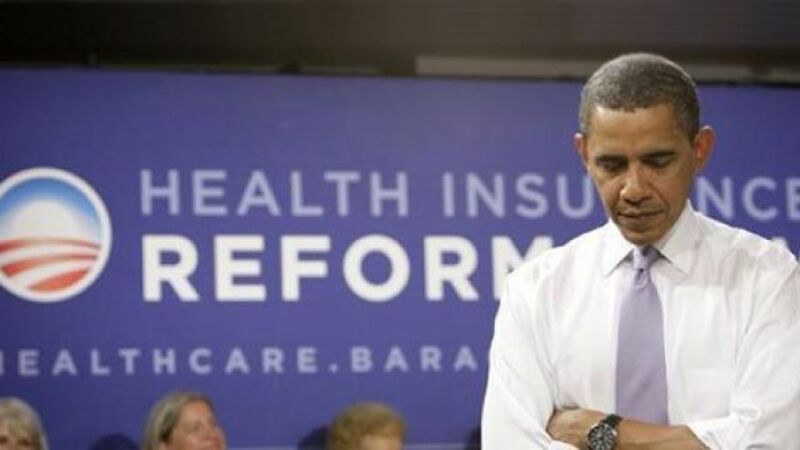 While there are certainly – as with any major legislation – those who have lost out as a result of ObamaCare, either through having to change their healthcare plan, pay a higher premium or lose some other benefit – for every one of these cases, there seem to be other people being rescued from catastrophic personal and financial ruin or uninsurability. It is quite telling that when Ted Cruz opened the floor to the public to make their voices heard – without the controlling hand of opinion pollsters or leading questions in focus groups – the message painted was overwhelmingly positive. The GOP has long tried to paint the passing of ObamaCare as the sudden imposition of socialism on America (conveniently forgetting huge programs such as MediCare for seniors, which are real, tangible socialism in action) against the will of the people and the founding values of the nation. In GOP-world, everyone is a small business owner or unspecified “wealth creator” being taxed to death in order to fund this extravagant giveaway by the “takers”. The real world, as glimpsed through the windows of Ted Cruz’s Facebook page, appears to contradict this worldview. 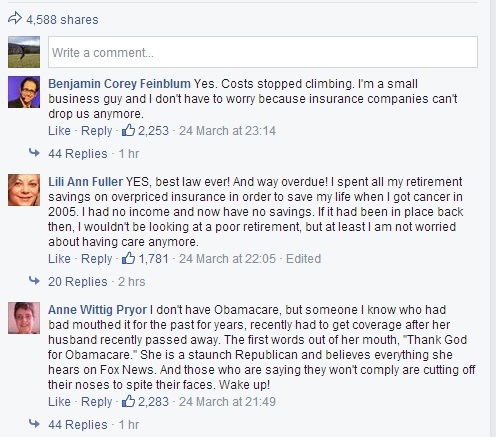 With ObamaCare, as with most big policies, there is merit in the arguments of both supporters and detractors. President Obama’s signature domestic policy achievement is not without multiple flaws, but those who oppose it undermine themselves by the fact that they made no effort to tackle the glaring problems in America’s healthcare system – sometimes laughably called the “greatest in the world” by ignorant people who have never set foot outside the United States – before Obama took office, and then decided to adopt a position of total, unwavering obstruction once reform efforts got underway – even denying and repudiating policies and ideas once favoured by their own side as conservative reforms. The Republicans could very well win total control of Congress at the midterms this November, and then go on to win back the presidency in 2016. If they do so, they will have to decide – and admit to the world – how much of their opposition to ObamaCare is real and principled, and how much was political posturing and pandering to the base. And the measure of this will be the provisions that they seek to repeal and those which they keep. If the Republicans want to be a serious party of government again – and sadly, there is currently very little sign that they do, even though America sorely needs a sane right-wing voice as part of her political discourse again – they will have to confront people like those who shared their positive stories of ObamaCare on Ted Cruz’s Facebook wall, and tell them precisely which of their newfound securities will be ripped away, and why. Over 7 million Americans have now signed up for health insurance through the various ObamaCare exchanges. If the Republican Party is to regain power, it must face a political day of reckoning with each and every one of them. Previous Article Who Is To Blame For The Left’s Stalled Agenda?